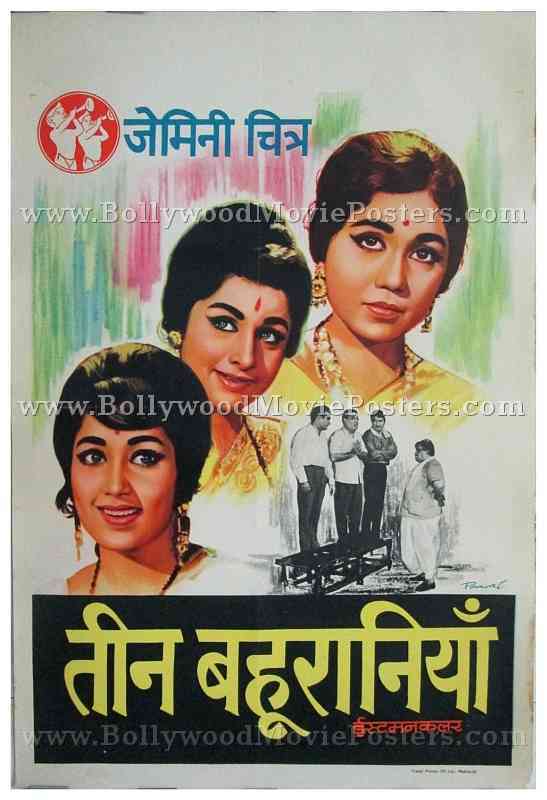 Old Bollywood movie poster of the Hindi film, Teen Bahuraniyan (1968) for sale. This is an actual surviving original vintage Bollywood movie poster of the 1968 comedy drama that featured one of the pioneers of Indian cinema, Prithviraj Kapoor. This vintage Bollywood movie poster features stunning hand painted artwork created by one of the most acclaimed Bollywood poster designers of his time, V.G. Parchure of Pamart Studio. The three lead characters from the film, i.e. the three daughters-in-law are portrayed in stunning hand painted portraits prominently on the poster. A black and white still photograph from the film appears in a smaller size at the bottom. Originally hand painted on canvas by Bollywood poster painter V.G. Parchure, this vintage Bollywood poster bears his printed signature in the name of his art studio Pamart on the bottom right.